I'm running Ubuntu 12.04.2 32 bits. The error doesn't show up if I start gksudo virt-manager. I don't know how to check for the daemon. I am a member of libvirtd. Rebooting the system where virt-manager is installed solved the issue. After installing KVM, run this command then that error will not occur again. was the only answer. The socket has its own daemon. That's unusual. For me, the error was caused because group membership changes don't apply without a logout-login (or reboot). I had just installed KVM and libvirt-bin. The installer automatically added my user to the libvirtd group, I had restarted the libvirt-bin service, but I was still getting the error. Simply logging out and back in resolved the problem by applying my new group membership. Assuming you just installed libvirt-bin and already confirmed that your current user is a member of the libvirtd group as the error message suggests, you will need to log out and back in for the new group membership to apply. Don't change file permissions to 777 Don't just run everything as root or sudo to avoid understanding what's wrong. The problem is discussed on Launchpad and the cause of this problem can be solved by installing the xen-utils package (xen-utils-4.4 on Ubuntu 14.04). I previously was getting around this issue by virt-manager through sudo at the command line. If the sockets are not showing, use service libvirt-bin stop; service libvirt-bin start to completely restart the process. 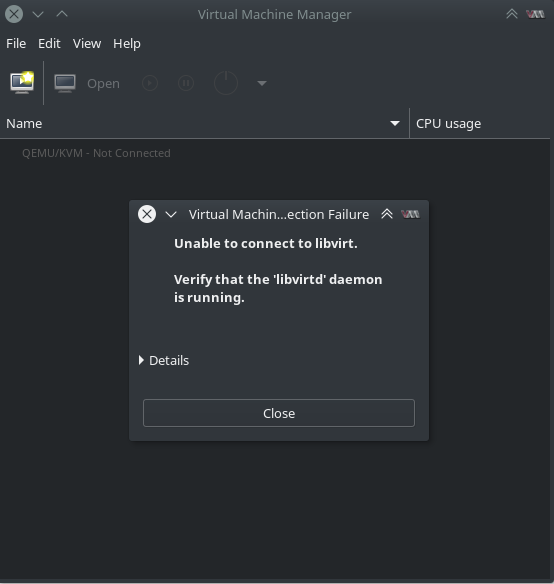 Using service libvirt-bin restart is not sufficient and will not re-create the socket. The libvirt-bin service can safely be stopped and will not poweroff the guests. As of Ubuntu 17.10, I had to also add myself to group libvirt. I had already added myself to libvirtd and did not remove myself from that group. I do not know if both are required or not. I did this since I noticed the contents of /var/run/libvirt were owned by libvirt instead of by libvirtd. After installing all of the packages stated by the op, you can log out then log back in. Anything that add you to user groups you need to log out and back in to be added to the new groups. It is a minor inconvenience, less of one than rebooting. This was flagged as not complete however this goes as a general rule for adding your user to a group. A relog is needed, that was the missing part that I did not see here. I had this same problem and in the detailed error report it talks about lack of permission to the libvirt-sock file. Changing the permission of the file /var/run/libvirt/libvirt-sock to 777 made it work for me. use Ubuntu Software to uninstall virtual manager, log out, log back in, install virtual manager, and run it normally without using sudo or even using the command line. Not the answer you're looking for? Browse other questions tagged virtualization kvm qemu or ask your own question.